Two Wyss Institute researchers will play key roles in an ambitious new project designed to make customized robots — and their myriad potential applications — widely available. Funded by a $10 million grant from the National Science Foundation (NSF) announced today, the new project seeks to develop a desktop technology that would enable people everywhere to design and produce a specialized robot in a matter of hours. The five-year project is part of the NSF’s “Expeditions in Computing” program. Wyss Core Faculty member, Robert Wood, Ph.D., and Wyss Visiting Scholar, Daniela Rus, Ph.D., are part of the research team, which encompasses Harvard University, the Massachusetts Institute of Technology (MIT), and the University of Pennsylvania. Wood is also co-leader of the Wyss Bioinspired Robotics Platform and an Associate Professor at the Harvard School of Engineering and Applied Sciences. Rus is a principal investigator at the MIT Computer Science and Artificial Intelligence Lab (CSAIL). “This research envisions a whole new way of thinking about the design and manufacturing of robots, and could have a profound impact on society,” said Rus. The current process for designing, producing, and programming a functioning robot is extremely expensive and time consuming; it involves hardware and software design, machine learning and vision, and sometimes advanced programming and manufacturing techniques. Moreover, the tools required to complete this process are typically only available to people who work in the field of robotics. The new project would automate the process of producing functional 3-D devices and allow individuals to design and build functional robots from materials as commonplace as a sheet of paper. Among the project’s initial areas of focus are creating an easy-to-use programming language and designing programmable materials that enable automatic fabrication of robots. The researchers hope to create a platform that allows an individual to select a blueprint from a library of robotic designs to create a customized robotic device that will address a specific need. Within 24 hours, the robot could be printed, assembled, programmed, and ready for action. By altering the way in which machines can be produced, designed and built, the project could have far reaching implications for a variety of fields. “This project aims to dramatically reduce the development time for a variety of useful robots, opening the doors to potential applications in manufacturing, education, personalized healthcare, and even disaster relief,” said Wood. 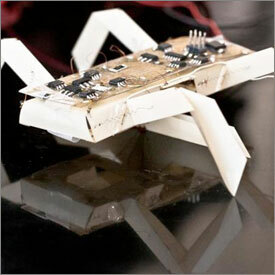 The research team has already prototyped two machines for designing, printing and programming robots, such as an insect-like one that could be used to explore contaminated areas and a gripper that could be used to help people with limited mobility. “It’s really exciting to think about the kind of impact this work could have on the general population – beyond just a few select people who work in robotics,” said Associate Professor Wojciech Matusik, also a principal investigator at CSAIL.